Latino style turkey or Pavochón is what is on our Thanksgiving menu. It is called “Pavochón” because is flavored with condiments and a citrus marinade typically used for lechón or Cuban style pork. Watch the video and see how easy it is to prepare this Latino Style Turkey! You can find all recipe details at Produce for Kids. I published that recipe last year and everybody enjoyed it! My Caribbean family is not very fond of turkey because they believe is not as flavorful and tender as pork. However for Thanksgiving having turkey is a must. In many Cuban or Puerto Rican households they prepare a latino style turkey. Pavo in Spanish is Turkey. Lechón in Spanish is Pork. That fusion results in a “pavochón” dressed same way as a traditional pork but using turkey. At home most of my guests prefer white meat so instead of using a whole turkey I buy the turkey breast. Doing it that way makes it super easy to cook turkey at home. The turkey breast cooks in a different temperature as the legs or the quarters have more fat and the heat is not directly on them. 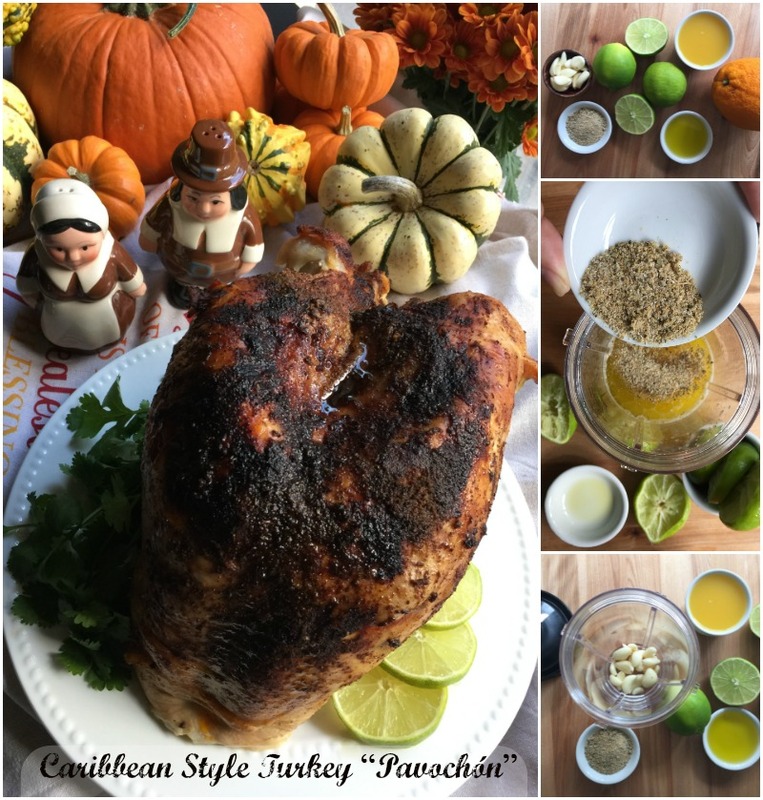 Latino style turkey or Pavochón is what is for dinner this Thanksgiving at the Martin’s family table. Made with citrus juices, sazón latino, garlic, olive oil, paprika and butter. That is why many cooks have this predicament on getting a nicely cooked whole turkey but end up having a dry turkey breast. Many like to inject juices, wine and broths to keep the moisture. A lot of basting is involved to assure that part of the bird is well taken care of. All of that is a lot of work but when using my tricks and tips you will be able to cook your turkey hassle free. My secret is using oven bags. That cooking technique keeps the turkey breast moist and comes out juicy and tender. Plus the cooking time is faster too. I like to use the drippings of the turkey to make a yummy gravy that goes perfect to dress up the latino style turkey meat. Our menu includes a the traditional fixings. Including sweet potato casserole, mashed potatoes, corn bread stuffing, a fresh salad with persimmons and homemade cranberry sauce. For dessert, flan, pecan and apple pie a la mode. Hoping you all have an blessed Thanksgiving time. Sending my gratitude for your continued patronage. This makes me hungry. I am going to try this recipe next time. New taste for thanksgiving. Very spicy, no? But I’m sure it’s a lovely turkey (it looks like it) – happy Thanksgiving! 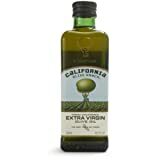 Hi Andrea this turkey is not spicy does not have any kind of spicy pepper it only has sazon latino which is a mix of oregano, cumin, black pepper and salt. Then it has citrus juice and garlic. This is a great recipe. Wow, I definitely am interested in tasting this! It looks so delicious — I love the ingredients too! Yum! This looks so fabulous, I think my entire family would love this dish!! My family and I season our Turkey with Latin flavor. Yours sounds and looks really delicious. This looks so delicious. I like the idea of doing something a bit different. Thanks for sharing. I’m all about that turkey! I would love to try the Latino style! 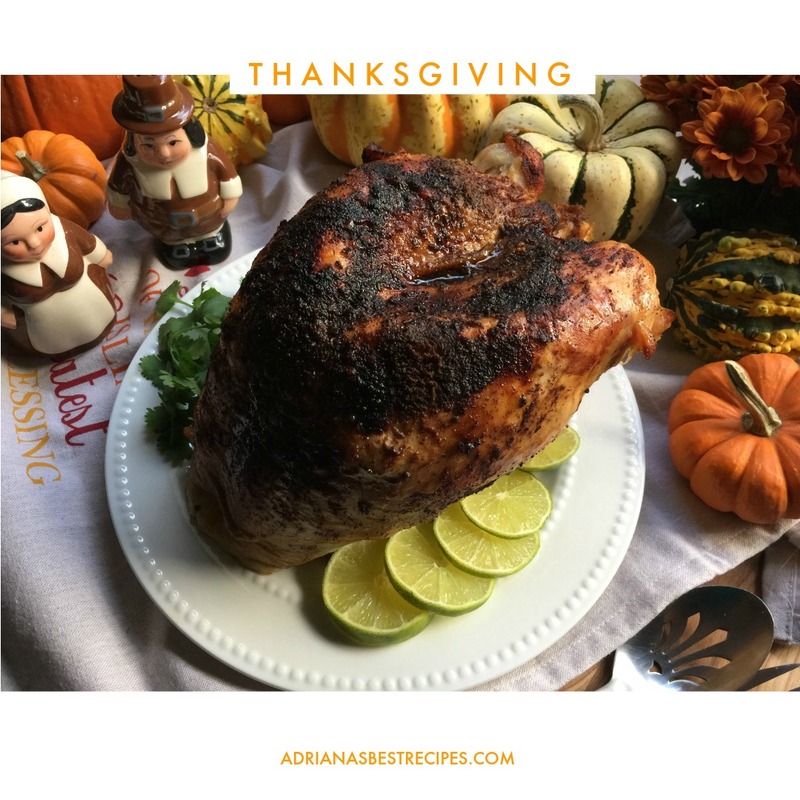 I think I’ll buy a turkey again (esp now that they’ll be on sale) and give your recipe a try… thanks! WOW! This sounds so good. I love the seasonings you use. Your video is such a great visual too. I haven’t cooked a turkey in several years but when I did I found that oven bags were my safest bet for moist turkey. And easy clean up!